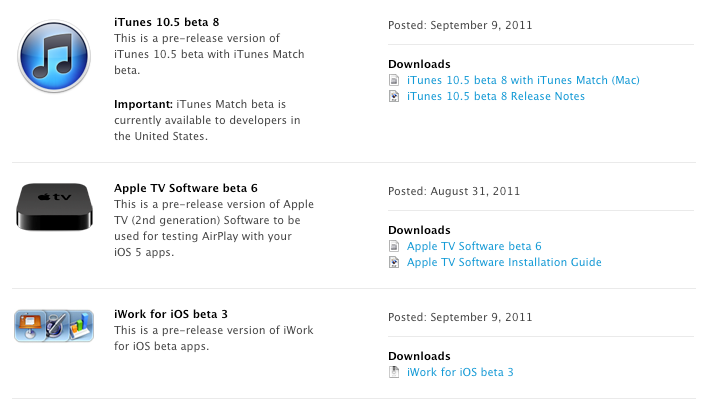 Apple has today released iTunes 10.5 beta 8 and iWork for iOs beta 3 to developers. These releases are intended to help developers testing the Music Match features of iTunes and iOS 5 as well as the iCloud integration of the iWork suite for iOS. We have been informed that the iTunes 10.5 beta 8 update notes refer to several issues with iTunes match including the fact that the ‘scan and match’ service is not fully enabled yet and that some songs may not be recognized as matches even if they are on the iTunes store. These songs will be uploaded to iTunes Match regardless of their status. You can also only add music from one computer at a time. You can also now back up your devices to iCloud right from iTunes itself. iTunes Match was one of several major pillars of Apple’s new iCloud product that was announced at WWDC. Once you have installed the iTunes beta, you have access to a new ‘iTunes Match’ tab that allows you to begin scanning your library for songs that match Apple’s database. If your songs match then they will be added to your iTunes Match catalog, if they do not match, iTunes will upload the songs, along with any artwork, that it is missing. Although the service is in beta the $24.99 yearly price tag still applies but developers will get three months free for participating.